The other day I was working on some fingerless gloves for my sister, and Marty started asking me questions about my crochet. Considering how little he knew about my crochet, I am sure my lovely blog followers know even less. So I thought it might be good to include a little MAQ here (Marty-Asked Questions)! Freshman year of college (2000) a friend showed me how to do a granny square. My first few projects were blankets that were essentially one giant granny square. Then I progressed to variations (such as two granny squares sewn together with a string that could sorta be a bag, or chains of granny squares that could sorta be a scarf). Therefore, I only knew hdc, ch, and could go only in circles. About 5 years later, my sorority sister Tiffany was staying with me in NYC during her internship. 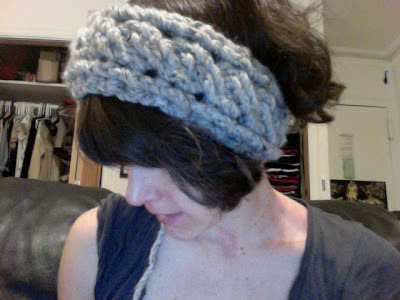 She was crocheting a blanket for her future husband, and showed me what felt like a Rosetta stone of crochet: turning. Finally I was not confined to circles! I have been messing around ever since then, learning all the stitches on my own, with a little help from my friends who were book editors at Sterling and would give me crochet books as gifts. Yes! Nearly every single project I have ever done is original TeaBeans design. I owe a great debt to a children's crochet book (the name I can't remember!). It taught me how to make beanie hats, which is the foundation for every hat I design. I have no interest in copying a pattern. I would sooner buy ready-made at a store. No, sorry. You can have my patterns for free! I just don't usually write them down. Plus, why bother charging, when I figured it all out on my own anyways?